Introduction: Gastric bypass is the gold standard of bariatric surgery. One complication of gastric bypass is the development of anastomotic strictures at the gastrojejunostomy. According to the current literature, the incidence varies widely between 3 and 31%. Our aim in this study is to determine if the choice of suture material at the anastomosis has any influence on early stricture rate. Methods and Procedures: We performed a retrospective review over a 20 month period during which a total of 119 patients underwent antecolic antegastric Roux en Y laparoscopic gastric bypass by a single surgical team. In all patients a running silk suture was used to form the outer posterior layer of the anastamosis . A linear stapler was then used to create a side to side gastrojejunostomy anastomosis. The anterior wall of the gastrojejunostomy was closed with a single layer of interrupted sutures over an orogastric tube. Apart from the type of suture used, the anastomotic technique was identical in all patients. Surgical outcomes were reviewed over two consecutive 10 month periods. From 12/26/08 to 10/26/09 the anterior wall of the gastrojejunostomy was closed with interrupted silk sutures . From 10/27/09 to 8/27/10 the anterior wall of the gastrojejunostomy was closed with interrupted vicryl sutures. All anastomoses were bubble tested intraoperatively. All patients were placed on daily PPI prophylactic therapy. Any necessary postoperative endosocopies and related procedures were performed by the surgical team. Results: A total of 8 symptomatic gastrojejunostomy strictures occurred. Of the 58 patients who had silk used at the anastamosis, 4 (6.8%)developed strictures at the gastrojejunostomy. Of the 61 patients who had vicryl used at the anastamosis, 4 (6.5%)developed strictures. All strictures were treated by endoscopic pneumatic, radial dilation with a through the scope balloon, requiring between 1 and 3 dilations until clinical resolution of symptoms was achieved. Antacid medical therapy was also used as an adjunct. 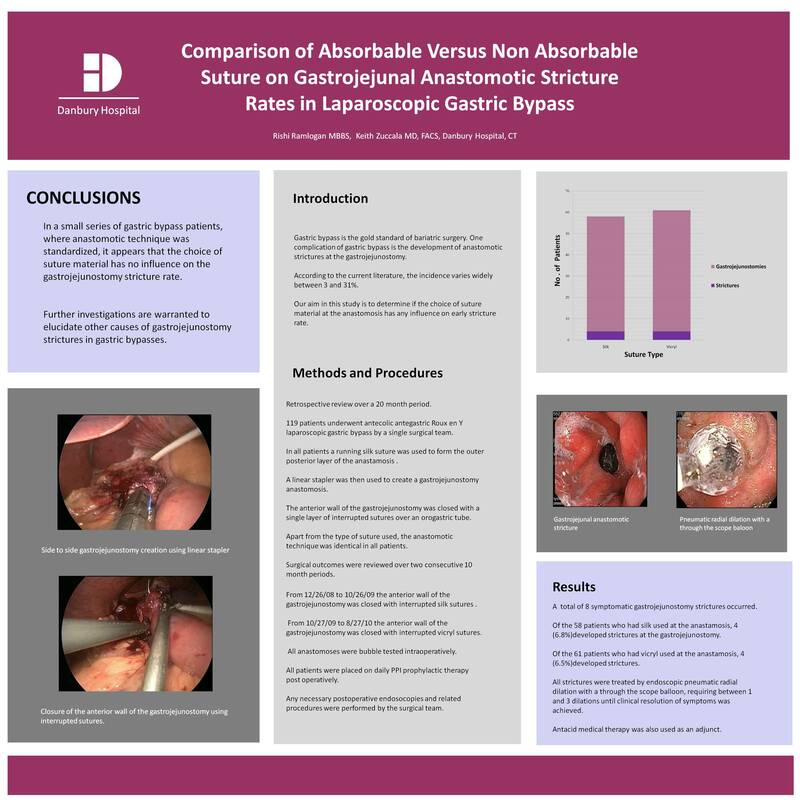 Conclusions: In a small series of gastric bypass patients, where anastomotic technique was standardized, it appears that the choice of suture material has no influence on the gastrojejunostomy stricture rate. Further investigations are warranted to elucidate other causes of gastrojejunostomy strictures in gastric bypasses.